The silk for this haori is lightweight. Komon patterns are created by applying rice-paste resist through a paper stencil and then dyeing the cloth a single color. The floral pattern is presented in tiny pin-point dots. A very thick paint was used in this design so that the design seems to sit on top of the cloth. 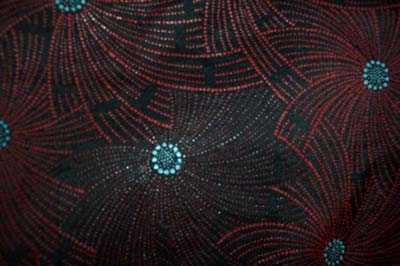 The thick red and chocolate brown dots are accented with aqua in this design. Komon patterns are known for their subdued but elegant coloring and the regular arrangement of the pattern. The haori is fully lined in a gradation dyed silk.